This year we reformed our usual yearly Annual General Meeting (AGM) held for 2018 to be more inclusive and engaging for tenants. We did this by splitting into two parts – the AGM would be attended by the Board of Management and Shareholders, while tenants would be able to attend a separate fun and informational day that we worked directly with tenants to create, this is will be our Tenant Day. Alongside this, during October LJHA will turn 65 years old! As a result, we will be hosting a party and you are invited. 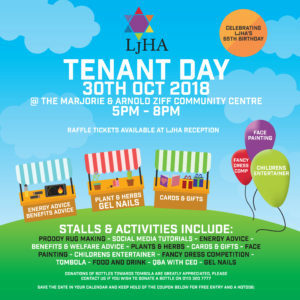 The event will involve a variety of fun activities, competitions, food, drinks, and many more fun/informational stalls that will be on October 30th. Tenant Day begins after usual work hours (starting at 5 PM and running to 8 PM) and is also during the school holidays, making it easier for families to attend at any point during the event. 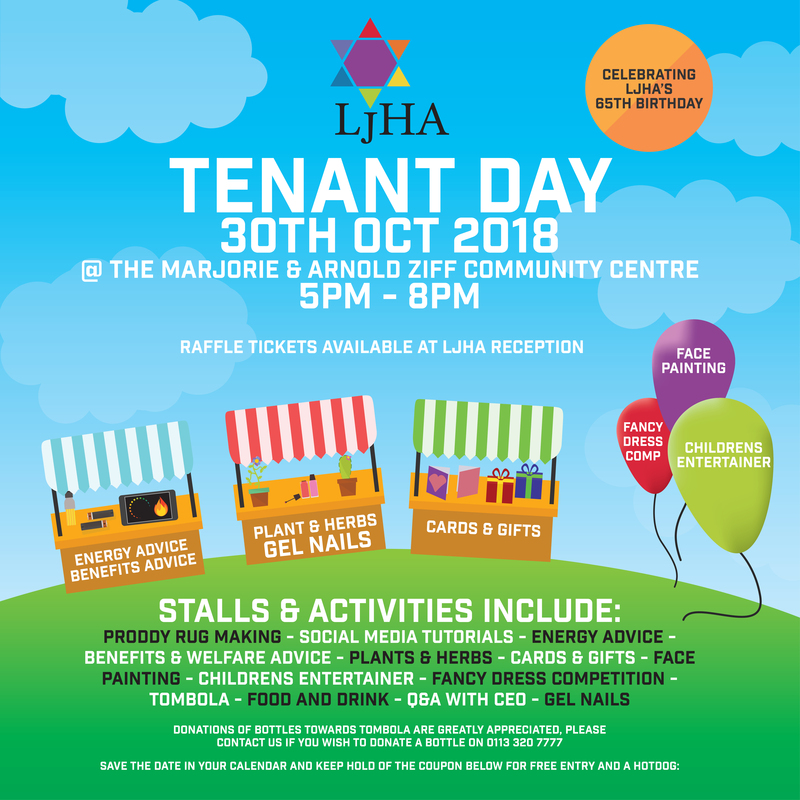 The Tenant Day takes place from 5 PM – 8 PM on Tuesday 30th October 2018. Marjorie & Arnold Ziff Community Centre. What stalls and activities will there be? All tenants will receive a coupon for FREE access to the day, as well as a FREE Kosher hot dog for them and their accompanying family. Finally, if you require more information or would like to host your own stall, please contact kerry.phillips@ljha.co.uk or call 0113 320 7777. We hope you can join us for our first Tenant Event to celebrate LJHA’s 65th birthday – keep an eye out for your invitation.